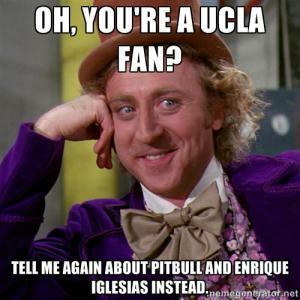 Oh, you're a UCLA fan? Tell me again about Pitbull and Enrique Iglesias instead. 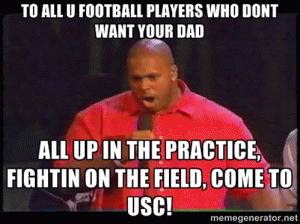 All up in the practice, fightin on the field, come to USC! What happens when the fog lifts in California? Q: What do you call a UCLA football player with a championship ring? 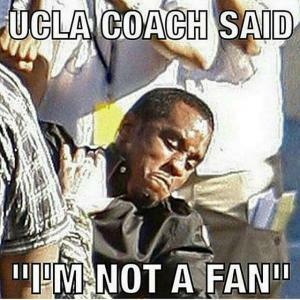 Q: How do you stop an UCLA fan from beating his wife? A: Dress her in USC red! Q: What do USC and UCLA students have in common? A: They both got into USC! Q: Why did Forrest Gump choose 'Bama over UCLA? A: He wanted an academic challenge! Q: Did you hear that UCLA's football team doesn't have a website? Q. How do they separate the men from the boys at UCLA? Q: What is a UCLA fan's favorite whine? A: "We can't beat USC." Q: How do you make UCLA cookies? Q: What to they call students who go to USC? Q: What does a UCLA Bruin fan do when his team has won the BCS championship?